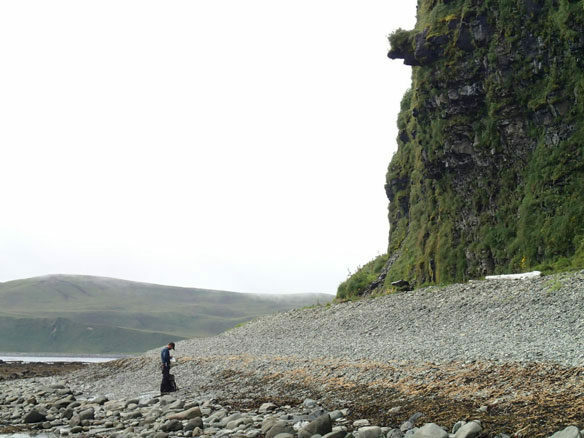 Geologist surveys the steep, coarse beach at the base of a 50 m high sea cliff along the northwest shore of Driftwood Bay, Umnak Island, Alaska. Credit: Simon Engelhart, University of Rhode Island. Courtesy: Simon Engelhart. The new findings indicate that the recurrence interval for large tsunamis generated in the eastern Aleutians ranges from 164 to 257 years, an important result that will inform updates to both the U.S. Geological Survey’s National Seismic Hazard Map and the tsunami source models of the NOAA-led National Tsunami Hazard Mitigation Program.